All of the works on this release have been premiered by Richard Watkins, with both Colin Matthews' Three of a Kind and Robin Holloway's Trio receiving their first performance on this album. Richard Watkins holds the Dennis Brain Chair of Horn Playing at the Royal Academy of Music, where he is also a Fellow. There are three 'Watkinses' on this album but just two of them are related. Cellist Paul and pianist/composer Huw are brothers. Richard Watkins is one of the most sought-after horn players of his generation. He was Principal Horn of the Philharmonia Orchestra for twelve years, and is currently a member of the Nash Ensemble and a founder member of London Winds. Closely associated with promoting contemporary music for the horn, Richard Watkins has given premieres of concertos by Maxwell-Davies, Osborne, Lindberg, Muldowney, Lefanu, and Colin and David Matthews. 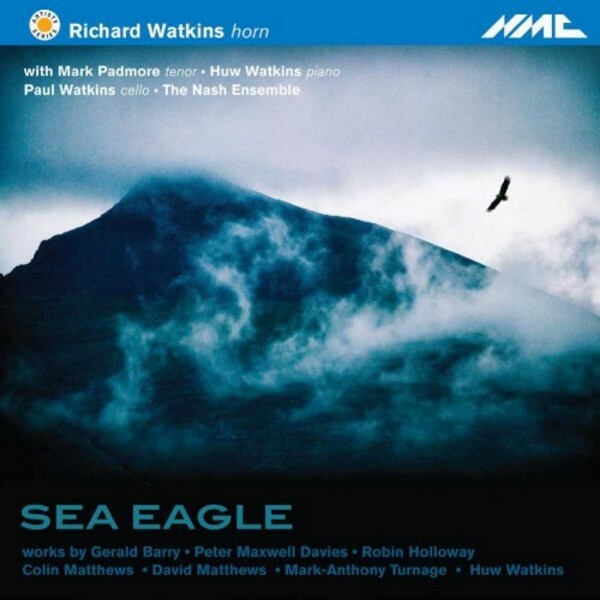 The title work on this album is Peter Maxwell Davies' solo horn piece Sea Eagle (1982). It was initially considered by many to be impossible to play but is now regarded as an essential part of the horn repertoire and is even a set-piece for the prestigious Munich Horn Competition. Richard is joined on this recording by a stellar line-up of chamber musicians, including Paul Watkins and Huw Watkins for an unusual combination of horn, cello and piano (C Matthews & Holloway), and tenor Mark Padmore to present the unmistakable sound world of Gerald Barry. His setting of Lewis Carroll�s famous poem Jabberwocky � which is first sung in French, with expressive legato phrases, and then repeated more forcefully in German � features some delightfully unconventional horn writing.